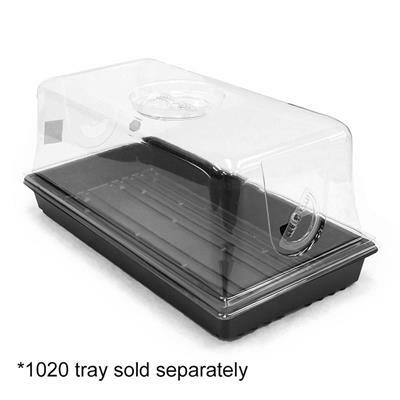 Clear Humidity Dome - 2" tall fits the black 1020 trays with holes and the black 1020 trays without holes. What can I say, it fits on top of the trays properly and comes off without hassle. Greenhouse Mega Store has yet to disappoint. Love their products, great to do business with! 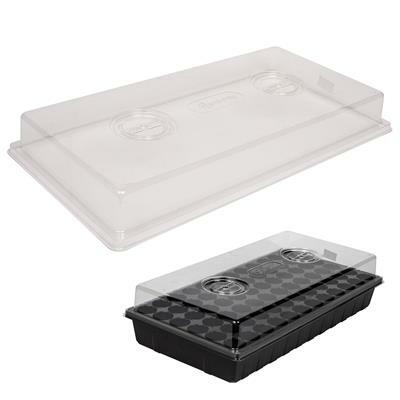 The clear humidity domes do not fit on the 1020 trays when the deep seedling inserts are being used in place of the standard depth ones. I ordered so many of these domes and now I can't use any of them, and there are no affordable ones that I can purchase that will fit properly. If you have ever bought tray covers at ,say, Home Depot, you will notice these to be much thicker. 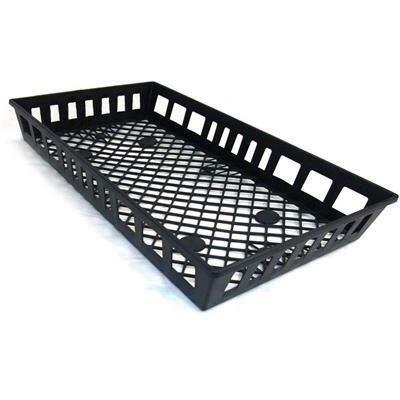 This will offset any extra cost by your trays lasting many years instead of 1 or 2 years if you are lucky. We noticed the difference right away. Working out perfectly. Using for seedlings and cuttings. I ordered 2 of these products. One arrived with a smashed corner. As the shipping box was not damaged, I can only presume that the packer damaged it before shipping. Propogation domes were wonderful! They put the Jiffy dome to shame. These were as advertized!Best quality humidity dome ever!Much better than what I could find at a box store. Will definitely order again! The domes are very sturdy and so much better quality than the ones that came with my trays. I will now order my trays from Greenhouse Megastore. They fit well..don't snap into place or anything but sit on top of the tray nicely. Can be tricky at first to keep on while moving around. Best to move the trays then place domes. None have broken over a few weeks time and purchased another batch. Much better quality than I found at the big box stores. Worth the $. These are flimsy and do not fit the trays very well. Also the vents do not like to stay in. I ordered 6 1020 permanest trays and 6 new domes which the description said went with them. But they don't fit. The domes are too small to fit the trays. I wrote but did not get an answer. This is not like GH Megastore, I wonder if I did not get it right. was totally happy with the domes - fit perfectly. The domes ensure the seedlings stay warm and water them at the same time. They came very promptly - great service! I was a little concerned after reading some previous reviews, no need to worry. These domes are great, much more durable than the retail ones available. Disappointed in the humidity domes. They don't fit the plug trays very well. First, they don't fit snugly, and I thought well, maybe they aren't supposed to. But they don't even fit evenly on the plug trays that I purchased at the same time. For the money, I expected better. I use these for seed starting. They have held up well to UV and they lasted 4 years in a hot California Greenhouse. Well made and much better plastic than you find in the kits. Delivery was prompt and items were well packaged. Would highly recommend. Purchased 1020 trays,606 & 808 cells-just what I ordered and happy. How ever both clear humidity domes were broken on the corners.Taped together and used as they were. Excellent product and superior service. Thank you for your quick service. 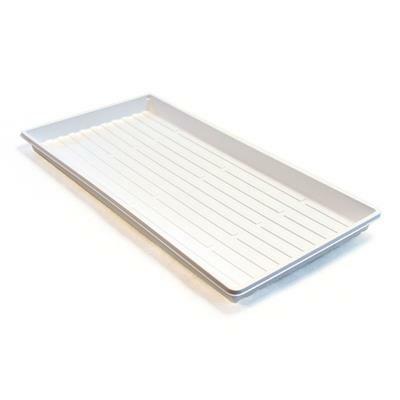 Excellent Product, fits snuggly on trays. The humidity dome seems to be great quality. As an inexperienced grower, I was trying to use it while growing sprouts, and managed to mildew the sprouts. So I think I learned that one must remove the lid at times or use less moisture. But I am glad I have this. It fits the oversized tray. These domes are very nice quality. They are a heavy weight plastic and won't break as fast as those flimsy ones. This is my second order of these as they work so well. I even use them to cover trays of 15 4 pots that I use to start zucchini and even sweet corn in late April. These are definitely heavy construction than than others I have tried. They work great on a standard 1020 tray. A great combo for seed starting. You should get several seasons from them. I like the clear plastic dome to raise the humidity above newly planted vegetable seeds. However, for my use the dome was too narrow such that all of my flat was not covered. Of all the domes I have tried, these are the sturdiest. I had germination of some seeds in just two days! Great for seedling's first few fragile days when humidity control is important. These work great for starting seeds. Good price. Can't do without these in my greenhouse. Keeps mice out of seedbed. exactly what I was looking for, I have the bottoms just needed new domes. Fit perfect and will work great! I love these domes, they fit my flats perfectly, and they are well made. Wouldn't use anything else. And the price is spectacular. the advertisement was misleading. I thought the product was also with the cell packs as it was shown in the picture...I now have 10 clear domes and no cell packs. not satisfied. 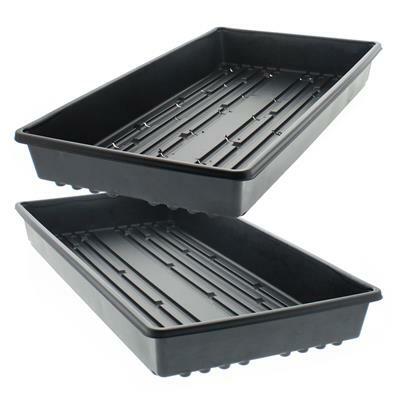 These are perfect to go with the 1020 trays and just the right height for starting seedlings. They are a good indicator that it is time to plant on your seedlings or remove the cover. High quality and excellent value for money. Definitely works to increase internal temperatures. I bought these to help with my seed starting in my 40 degree garage. Even with a seed mat warmer I couldn't get temperatures above about 58 degrees, but once I placed these covers on, I got temperatures around 70 degrees. Only problem is you will need to lift the lids frequently or occasionally to get air flow and circulation. I wish they had small vent holes. Dependable service and for the price, a great product. I love these, been using them for years, and greenhouse megastore has the best price I've found. In fact, I need 5 more. Again, great product at a great price!I just love this store and web site! Very easy to navigate and find what you want at the price you can live with! These domes are so much better than the ones I've used in the past. Made so much better. Should I need more then I'll be back to purchase these again. Thanks! used the complete set in one day and all work very well, i am on the second round of use and they show no wear. 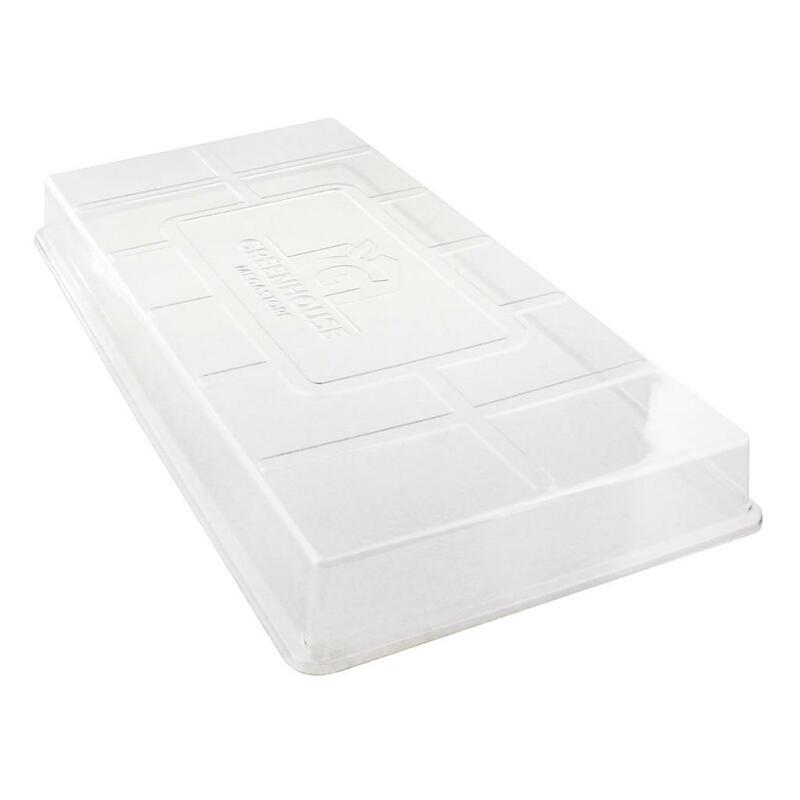 A plastic humidity dome is a must for starting seeds. I previously used plastic drop cloth but you do not get the height that the dome provides and I have had trouble with some of my plants sprouting before others and then getting the 'bends' because there was not enough head room. 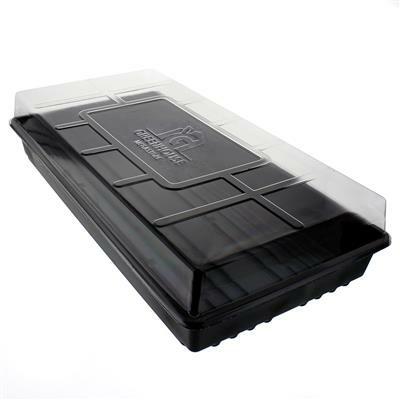 This product is sturdy and fits nicely on top of the growing flats. After surfing for prices, I found these to be the best price. Be careful to measure your growing flat to ensure this size will cover it as they make serveral sizes of flats. were is the humidity they won't hold humidity for more than a couple hours. It's because of the hundreds of pin holes. The domes I bought for another company have vents that I can open and close, and they were only 20 cents more than yours and they work. I have had harder plastic domes, but these may turn out to be better with any subtle pressure (less likely to crack like the stiffer hard ones). They are very clear and fit the trays perfectly. Use them to cover seedlings in late winter / early spring. Durable. Domes that came with trays were damaged, so I found these replacements at a good price. They work well as expected. Great strong built product.Shoud last hold up for several seasons fo use. These domes are of excellent quality; not the flimsy domes that many companies are offering now. I highly recommend them to the serious gardener. These have to be replaced frequently and the price is good for the tool. 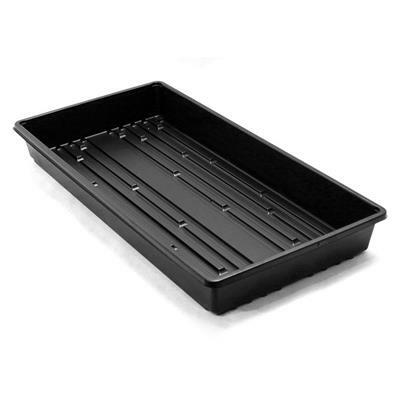 They are clear plastic lids for black plastic trays. What else can be said about that? They were just what I expected, no complaints. These fit the 1020 solid bottom trays just fine... but they don't fit other plug trays I've purchased. 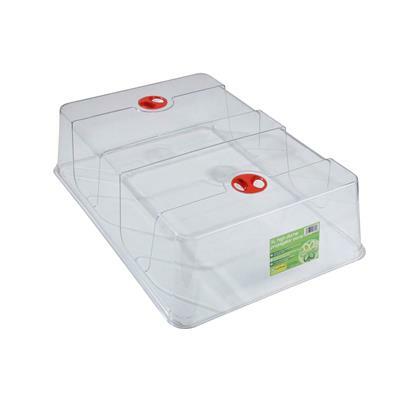 I bought these domes to go over the trays that I purchased from this site. The quality of the domes are good and I think they have good value in that they are somewhat inexpensive. but the fit is very poor over my trays. They domes seem to be a tad too large for the trays. I bought these because the site referenced them to use with the 1020 trays and inserts. They however do not fit securely. Have lost moisture and need to check frequently. Work fine with just tray in grass flat sowing applications, but will not buy again. 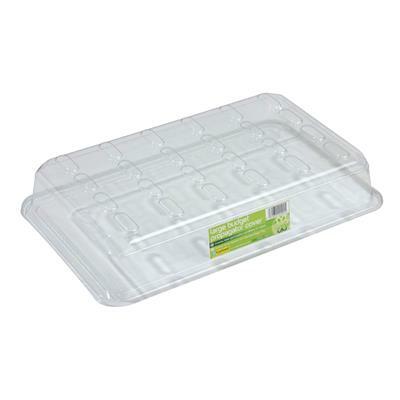 Have used plastic wrap over germination trays in 4 flats are are more moisture, temp sensitive. They are heavier/sturdier than most I've used in the past, but fit is an issue. The domes are shaped well to allow the sprouts in the outer cells room to grow. It would nice if there were a way to vent the domes. This year was the first time for me using the clear humidity domes and I must say how well it made a difference. It not only helped with the germination, but I was so thankful for not having to water it as often! Fits poorly over 4- and 6-packs trays. Too large. Does not provide a good seal, slides around. Disappointing but marginally functional. My grow light is in our basement and it is somewhat cool. This dome is perfect for trapping moisture and warmth above my seedling pots. They are sturdy and work great! Very study and they are designed to fit the 1020 trays. Very useful for maintaining soil moisture in the trays.